FileArmor is a very straight forward and easy-to-use, fast and high-secure defence for your files and folders. It uses an optimized AES implementation that conforms to FIPS-197, and a SHA1 implementation that conforms to FIPS-180-1. The key-size can be 128, 192 or 256 bits. 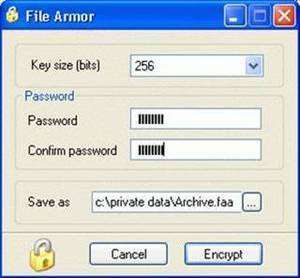 The optimized AES version allows very fast speed of encryption/decryption. FileArmor 1.10 is a shareware program and can be used as a demo to try the software until the free trial period has ended. A full version of the program is available after the trial period ends. For security reasons, you should also check out the FileArmor download at LO4D.com which includes virus and malware tests. Additional screenshots of this application download may be available, too.